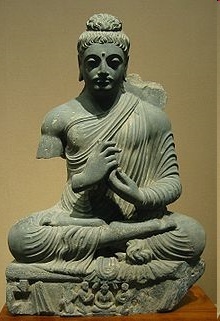 The details of Buddha’s Four Noble Truths vary somewhat depending on the source. I recently dug up the source for the version that I long ago found to be most useful since it was the most succinct I’d seen. Nevertheless, I had a minor problem with how the Third Noble Truth was stated, and way back then changed a word or two. Rereading my original source makes me want to revisit this and ponder why I revised it in the first place. I changed the “conquers self” to “surrenders self”. I was immersed in the Bhagavad-Gita at the time, which preaches surrender, e.g., “no man can be a Yogi who surrenders not his earthly will”. Perhaps the idea of ‘conquering self’ felt too aggressive to me. A few years ago, I thought back on that and changed it back to what I thought was the original, “He who extinguishes self will be free from lust…”. Recently I came across that old book and saw the original ‘conquers self’ phrase. There is a ‘chicken and the egg’ aspect to this. The Second Noble Truth ends with… The illusion of self originates and manifests itself in a cleaving to things. The desire to live for the enjoyment of self entangles us in the net of sorrows. Pleasures are the bait and the result is pain. How is one to apply the Third Truth, which begins with He who conquers self will be free from lust, when self is an illusion to begin with. If something isn’t real, what does ‘conquer’ mean in practice? It certainly isn’t the same as conquering a physical enemy coming at you with guns a-blazing. Another oddity is how the Third Truth continues with; He no longer craves and the flame of desire finds no material to feed upon. Thus it will be extinguished. However, the Second Truth begins by saying, The cause of suffering is lust. The surrounding world affects sensation and begets a craving thirst that clamors for immediate satisfaction. Lust gets the cleaving ball rolling in the first place! Yet conquering self allegedly frees you from lust — the flame of desire. This feels oddly circular — chicken and the egg-y. I get past the chicken and egg dilemma by keeping keenly aware that my needs, desires, fears, and worries all produce my illusion of self. The self-illusion (ego) has difficulty holding up against such watchful clarity. Conquering self then comes down to just maintaining enough perspective to avoid the tricks biology pulls on me — the bio-hoodwink (1) as I call it. In other words, the more aware I am of how biology is pulling my strings, the less convincing the illusion becomes. Conquering self is really a matter of seeing how the trick plays out. Once I clearly know how a trick works, its illusion can no longer captivate me. (See It’s Like Magic.) When the illusion of self no longer captivates me, I’ve conquered it, or at least I’ve established a truce. One final thought on Buddha’s Third Truth. If I were to rephrase it, I’d put it this way: “He who conquers, surrenders, and comprehends self will be free from lust. He no longer craves and the flames of desire find no material to feed upon, thus they are extinguished.” The conquering comes first as you wage battle with yourself to ‘get your act together’. Next comes the surrendering when you realize that conquering your self is not possible, at least in the normal wage war sense of the word. Finally, seeing what is actually taking place, and comprehending how a bio-hoodwink is always pulling strings diminishes the “illusion of self” enough to return to one’s roots and simply be who you innately are. (1) Bio-hoodwink: I coined this term for the trick biology plays on perception. (See Peeking in on Nature’s Hoodwink.) Chapter 65 says: Of old those who excelled in the pursuit of the way did not use it to enlighten the people but to hoodwink them. The oldest ‘of old’, when it comes to living things in nature, is the biological process of life, ‘hoodwinks’, and all. For example, a bio-hoodwink tells the brain that the richer the food, and the more you eat of it, the better. This was the case in the wild before we cleverly devised ways around natural limitations in order to make food as rich and plentiful as we wished. Alas, the bio-hoodwink is inherited DNA and out of sync with our clever yet ignorant innovations. The only counter-measure we have against this is understanding, which explains why Buddha put Right Comprehension at the head of his Eight Fold Path. Word are odd little creatures. In the end, I’d have to say they are simply shadows of our emotion–an expression of feeling. They are subjective, yet we tend to regard them as external and real in their own right. Of course, it’s only natural that we do this. “He who extinguishes self…” has the same problem as “he who conquers self…” doesn’t it? The illusion of self is caused by desire. What we need to hold on to defines who we think we are. Still the idea at least gets us to first base. It is interesting to think of this in terms of “flame” and “fuel”. I suppose the fuel is the instinctive drive to survive. The flame is the stimuli that ignites the fuel. Our thoughts influence what conditions in the environment become the spark (stimuli) that touches off the fuel. Diffusing some of our thought is our only way to intervene. Meditation certainly is an effective path to that! A path to at least improved peace of mind, eh Lynn. Amen. Sharing with others can be odd. When we were holding weekly taoist meeting many would come and carry on about The Tao. It always felt like they were using the word Tao as a substitute for the word God. I’d say, truly taoist ideas are universal, and one need never mention the word tao as part of the process of sharing. Another choice in words: how about “He who extinguishes self will be free from lust.” A flame is really nothing much separated from its fuel. Regarding sharing Taoist ideas with others, I was thinking perhaps the right starting point is the practice of meditation. When I first started meditating as a 24 year old I would read the Tao Te Ching, have no interpretation of what the words meant, but the words deeply resonated inside me. Yes, I was just thinking this morning how the term “bio-hoodwink” might well pass into common parlance, as you put it. I suppose it would be helpful to those who already suspect such, but just don’t have a suitable, succinct way to sort through the blizzard of feelings and thoughts that stir around when sorting through this human condition. I sure know it helps me keep life in perspective! This is really saying it take time for each of us to mature. With increasing maturity, emotional balance improves. In the end, this is what helps “theory” (thought) mesh with “experience” (feeling). As always, it is when the rubber hits the road that we know the difference between what we understand and Understand. There are no short cuts which is quite fine, really. It puts a true silver lining on getting older which compensates for the physical declines endured! Anyway, you are so well on your way. I find it helpful, as I journey forward, to be as mindful as possible of where I’ve come from instead of where I wish (idealize) to go. A thought occurs after reading this. Good move making a large point of making “bio-hoodwink” a term to be used. In doing so, there’s always the chance it’ll pass into (or at least nearby) common parlance, and then some of the idea it conveys (some will have been lost or warped, chinese-whispers style, of course) will be dragged along with it into people’s conversations and thought processes. Maybe that’s idealistic. I’ve found you can’t try and pass on the even common sense ideas in taoist thought to most people, it seems to require the mind to be at the right starting point.